by Niall Douglas. Last updated 2016-12-09 00:00:00 +0000 UTC . This page has been accessed 7,081 times since the 9th December 2016. This is an article written Christmas 2016 about spending thousands of euro buying a used car off the internet via auction from another country, never having seen the car ever before. Think of it like eBay where you can bid on an auction for some item, well increasingly it's beginning to make a lot of sense to buy your next used car the same way even though this is a very uncommon way of buying a car in Europe (in the US and Australia buying used cars remotely is very common for years now). This is the story of how I bought a year 2011 1.6L diesel Ford Focus Mk 2.5 with maximum trim via auction from Scotland despite living in southern Ireland, using the internet alone for everything. Here is a picture of the car bought, with our previous Mk 1 Focus in the other photo. Our previous car is a year 2000 1.4L petrol Ford Focus Mk 1 which has proven to be an unexpectedly superb used car, sixteen years old and still low maintenance, still regularly hits 40 mpg. Only cost us €1,300 back in 2012, and perhaps a little more than the same again has gone into it for replacement worn out parts, tyres etc in the past four years. There has been an element of duct taping (often quite literally, you might see some obvious duct tape in the photo above) up any problems instead of properly fixing them, but when a car is this old it's unwise to invest in repairs when yanking parts of crashed cars is a lot cheaper. However, some stuff recently has changed. Firstly there have been some big insurance price increases in Ireland in these recent years, with a majority of the increases landing on old cars. Indeed, only two insurers remain in Ireland which will insure a car fifteen years or older at all, and they do so for a premium. My Mk 1 Focus used to cost us €350/year for insurance, that's heading towards a grand a year now. A newer car isn't so expensive to insure. Secondly from 2008 onwards Ireland changed its annual motor tax to CO2 based. This meant a large reduction in tax (about half) for most diesel cars, making the annual cost saving from petrol cars considerably enlarged for cars aged eight years or less. Unlike the UK, Ireland's annual motor tax is expensive, the year 2000 Mk 1 Focus costs me €400/year to tax as it has a "large" 1.4L engine. A post-2008 diesel rolls in at just €200/year to tax. Furthermore Ireland, like most European countries which aren't the UK, has cheaper diesel than petrol and you get 15% more litres of diesel than petrol for the same money. I reckon we spend about €3,000 a year on petrol and tax and insurance with the Mk 1 Focus, and as our children leave toddler stage they will need driving to Cork much more frequently which currently costs about €7.50 per round trip in fuel @ 40 mpg. With a diesel I reckon that drops to €4.80 per round trip in fuel @ 55 mpg, a 36% cost saving on longer trips. Assuming a 10% improvement in average mpg (indeed we got 250 miles for our first fill of €30, that equates to 43.8 mpg) with the reduced tax and insurance, I reckon a 33% running cost saving is about right. Thirdly, as much as cars from the early 2000s are hugely safer than just a decade earlier and recent progress is nothing like as big, as a father you do worry more about safety for your family than when it's just yourself. The Focus Mk 1 was class leading in year 2000, but the fact it mashes your legs into pulp in a frontal crash and collapses your kidneys and lungs in a side collision aren't ideal. Surviving a crash with life long disability isn't as nice as surviving with all limbs and organs intact. The Mk 2 Focus is considerably less mutilating. Of course, converse to all the above running cost savings, an expensive used car comes with much increased depreciation. By the time a car reaches €2k, depreciation isn't expensive compared to running costs and maintenance, but a €10k car still is losing maybe a grand per year. What you're really looking for for cheap motoring is the sweet spot where depreciation plus annual costs plus maintenance are all together low. And don't forget your opportunity costs: the time you spend dealing with the stress of buying a replacement car and dealing with problems is also worth money. Not to bore you, but I coded up all the factors above into a spreadsheet and ran a solver to find which make and model of used car would have the minimum motoring cost for the next seven years. I was quite surprised to learn that buying a post-2008 diesel despite the much larger financial outlay suddenly makes sense - about €1,000 drops off your annual running costs, saving you €7,000 over seven years. Assuming an old reliable banger would cost €1,500 at 13 years old, you'll be in profit if you pay €8,500 or less for a used car aged six years or less. This is of course a unique one-time situation caused only by the unique Irish combination of diesel pricing, tax changes and insurance changes. On top of all that, thanks to Brexit pushing down sterling against the euro, there are plenty of low mileage post-2008 diesels on the Irish second hand market for less than €8,500. Hence, for the first time in my life, it makes financial sense to drop many thousands on a new used car and hence this page. In the end, our five year old Mk 2.5 Focus cost €8,000 including all overheads like VRT, so we came in both under breakeven budget and under breakeven age, so assuming it remains reliable we shall save money over the next seven years and considerably more so if it remains reliable to fifteen years old. The right used car is always going to be different for every individual. In our case, we have two children both in rear facing (i.e. long) car seats which meant we had to buy a C-segment or larger car whatever the case, else the seats won't fit in the back. I had actually been thinking originally of a D-segment Honda Accord Executive given the reliability reputation of Hondas, but much to my surprise at five to seven years old the Ford Focus is more reliable than the Accord and costs much less to repair too. This was not expected, and I'd strongly suggest you visit http://www.reliabilityindex.com/ yourself to compare whether the car you have in mind is as reliable and cheap to maintain at age as you think it will be. Prepare to be surprised: German branded cars (VW, Skoda, Seat, BMW) do not do well at age. They are both unreliable and expensive to repair. If you are sensible, you will avoid them. Most of the Japanese cars are reliable at age, but most do not come with diesel engines or if they do, the engines are brought in from external suppliers which makes them expensive to fix and parts and crashed car salvage can be hard to find in Ireland especially. That leaves the other European car brands like Fiat and Peugeot which historically have a bad image and reputation, but some recent individual models do very well in the top 100 most reliable cars thanks to how budget mass market cars are increasingly collaborations between multiple manufacturers, so some Peugeot cars have only a small minority of Peugeot made stuff in them. Similarly due to this outsourcing, some models by a manufacturer with a great reliability reputation can do very badly - the least reliable car in the UK by far right now is actually a Nissan, not what you would have thought of a Japanese mark. Once you get into your research, you'll start to find Ford's popping up a lot in any purely rational ranking of best used cars to buy. There are a ton of them in salvage yards, and even if there weren't, spare parts for them are cheap, as are services and other maintenance in Ireland and the UK. All this lowers the annual running costs of a used car which inevitably will need more wear and tear parts replaced than a new car such as a clutch, pumps, timing belt etc. Since around year 2000 Fords at age are amongst the most reliable and cheap to maintain older cars around, apart from Japanese cars very little comes close at ten years old and they are always cheaper to repair than any Japanese car at least in Ireland and the UK thanks to plenty salvaged parts from crashed cars. Both Fords and Japanese cars are far cheaper at age than European mark cars. I know that none of this is the widely held perception by the public, but check the statistics and see for yourself. Be cautious of 2008 era diesels! If you're looking for a diesel, be very careful of models with first generation Diesel Particulate Filters (DPFs). These parts were brought in as part of the Euro 5 emission requirements between 2008 and 2010, and as with catalytic converters initially, the first generation models were not reliable and caused a lot of expensive problems. Manufacturers moved quickly to bring in second and sometimes third generation units, these were much improved and with time they will be as reliable as any other part of a modern car. If the used car you are looking at is 2009 or earlier, you can legally remove the DPF in Ireland and the UK, this is strongly recommended for first gen units - don't forget to remap the ECU to make it ignore the missing DPF. If it's 2010 or later, whilst current annual road worthiness testing doesn't currently test for emission particulate size, they say it is coming before 2020 thanks to the VW emissions scandal and any car 2010 or later which emits too much of the wrong particulates will be failed. Thankfully by 2010 most, but not all, diesel cars had at least second gen DPFs fitted and later I'll show you how to look up what generation of DPF is fitted to a car you are interested in bidding upon. One big reason that Fords will tend to land high up your rational priority ranking of the best used car for you is because they have amongst the worst residuals on the used car market - that is, terrible for the person who bought them new, but excellent for you the used car buyer. Trim levels appear to have virtually no effect on a used Ford's price, so you can pick up the very top trim level with all the flashy gadgets, heated seats, automatic stuff and extra torquey engine for only a few hundred more euro/pound than the bottom trim level. Awful for the seller who dropped 15k more on buying the top trim, great for you. Different brands can be the same car! As mentioned earlier, for the smaller mass market cars there is an increasing tendency for a manufacturer to no longer make most of a particular model. For example, the Ford Focus Mk 2 is the same car platform as the Volvo S40, V50, C30, C70 and the Mazda 3 and Biante using the many of the same engines, suspension and a fair bit more. You'll pay a lot more money for that Volvo or Mazda though, despite it really being the Ford Focus Mk 2. People are becoming increasingly aware of brand snobbery as manufacturers such as Volkwagen sell the same Golf in Skoda and Seat forms but at reduced prices, so be aware that the car you really want may have a much cheaper similar form in a less desirable mark. If you're rational, choose the cheapest brand. But I don't want a boring Ford! The biggest problem with a Ford of course is they are boring cars. Boring to look at, especially boring insides, and common as muck in ownership. There is very little "special" about a Ford. Most come with boring engines and are not an especially fun drive, though since year 2000 or so the handling in a Ford is night and day better than they used to be. However you are probably judging Ford cars based on the typical Fords seen in Ireland which are usually the cheapest lowest trim possible thanks to the Irish Vehicle Registration Tax (VRT) which is particularly punishing for higher trim levels. These come with underpowered engines and spartan interiors making Ford cars look tired and boring. In the UK, there is no VRT and average trim levels are much higher, so if you're considering an import from the UK you'll find the cars from there tend to be much nicer than Irish cars. For example, the top trim Ford Focus diesels come with factory remapped engines so your normally 90 bhp 1.6L engine puts out 110 bhp, as was the case in the Titanium spec Mk 2.5 Focus we bought off auction. The extra 20% torque is quite noticeable, especially during overtaking at speed or lifting off from a red light. You'll also find at UK auctions much more variety in engines than you'll be used to - you can get a 2.0L diesel Focus for very similar money to the 1.6L which sends 50% more power to the wheels than the bog standard Focus for example. Be aware insurance loading will be a lot higher with more powerful engines, as will motor tax and fuel costs. If you really want to see what a Ford can do and don't care about cost, try a Focus RS which is a Focus with a silly powerful engine in it and is hence very fun to drive, yet can still carry around your family etc just like a boring Focus. Anyway, enough with advocating Fords at you. A very important point to consider when estimating the running costs of a new used car is fuel efficiency. As we all should know by now, recent European fuel efficiency standard testing allows manufacturers to cheat and cheat extensively, so ignore whatever MPG the manufacturers claim for any car made from about 2008 onwards except for figuring out motor tax rates. Instead look up your intended car's "Real MPG" on http://www.honestjohn.co.uk/realmpg/ which gives a much more accurate guide based on reports by owners of those cars, showing that manufacturer claimed > 60 mpg is often in real life less than 50 mpg. As always, the heavier and bigger the car the necessarily worse fuel efficiency it will have, and if you mostly make short urban trips then unless the car you are buying is electric or hybrid, don't expect better than 40-45 mpg no matter the car's average fuel efficiency as most of your fuel goes on braking and clutching rather than moving. Hybrid and electric cars recharge themselves from braking and don't have a clutch, hence they beat almost everything else for frequent short urban trips. Very strongly consider buying a hybrid or electric car instead of a diesel if that's your typical driving, a diesel is no more efficient than a petrol for that use pattern, and indeed often will end up with an expensive clogged DPF as diesels with a DPF don't like many short trips without long trips to clear the DPF. If buying a hybrid or electric used, make SURE you account for the cost of replacing its battery, they lose considerable capacity and therefore car range over time, and it's typically a few grand to get the battery replaced. Each model of any car is mass produced for a number of years without many changes, this is known as a generation for a car. Taking for example the Ford Focus yet again, the Mk 1 Focus ran from 1998-2004, the Mk 2 ran from 2005-2011, and the Mk 3 from 2011 onwards. Each generation is further subdivided into trim refreshes, so whilst most of the car is unchanged, the engines, the body panels and the interior will be refreshed to keep a car looking modern and contemporary and with the latest fuel efficiency and emissions control. For example, the Mk 2 Focus had a Mk 2.5 era 2008-2011, the Mk 1 Focus had a Mk 1.5 era 2001-2004. As with any complex technological item, the first few hundred thousand cars of a generation will have unforeseen problems requiring remedial fixes better known as a product recall. Recalls are actually very common, people don't notice them because most recalls occur when a new car is still under its free servicing period from the dealership and so sometimes quite major problems like the fact the car will spontaneously catch fire and explode, or the braking system experiences total and complete random failure at speed get fixed without anyone noticing. As problems are identified and fixed, later production of the same generation will have those problems eliminated and in general, later production of the same generation will usually be more reliable, less problematic and a better used car experience than earlier cars in the same generation. This is why I very specifically bought a 2011 Ford Focus registered in February 2011. It was the last of the Mk 2.5 (i.e. post 2008 refreshed Mk 2 generation) before the Mk 3 was introduced in March 2011. All the product recalls and fixes of the Mk 2 and Mk 2.5 Focus were built into the car I bought during manufacture, and there were quite a few, with new recalls of pre-2008 models for spontaneous fires occurring right up to 2012. Just to highlight how important buying only the last release of a generation can be, the Mk 2.5 Focus (2008-2011) came with either a first or second gen DPF, with the second gen being introduced in cars manufactured from 2009 onwards (it can take six or more months from manufacture to sale and registration). The first gen DPF had serious reliability problems, required replacing at £1500 a pop every 75,000 miles and needed regular top ups of an expensive fuel additive fluid called Eolys which was £100+ a refill, if the tank ran empty you could expect several expensive components to clog and fail. The single most common complaint on owner's forums for Mk 2 diesel Focuses was this first gen DPF going wrong in some way. The second gen DPF is a maintenance free coated affair capable of higher regeneration temperatures and is expected to last the lifetime of the car, no fluid tanks or anything else. Owners with this DPF very rarely mention problems, you'll see a big disparity between posts by pre-2010 diesel Focus owners versus 2010 onwards Focus owners where lack of posts is usually a very good sign. All of the pages under the Review tab are useful and should be read in total - watch out for extra sections hidden towards the bottom of a page. The real meat though is under the Specs page, this lists each of the possible engines for each trim level and the stats about each engine, plus its insurance loading group and UK road tax. Don't forget to read Owner Reviews of the car for your particular model and engine choice. Also look for the section showing alternatives in the same class of car, it can be useful when you're not exactly sure which make and model you want. The two gold star features of this site are the "Real MPG" database which gives user supplied MPG values which are more representative unlike the fake MPG values supplied by manufacturers, and the Model History + Specifications pages. The latter is especially useful because it lists all the product recalls and refreshes of a car during its model version so by comparing the detailed specs from the beginning of its history to the end of its history one can see, for example, that in the beginning the Focus diesel was a "Stage IV emissions" engine whereas at the end it had become a "Stage V emissions" engine with the second gen DPF. All these little bits of information suggest avenues for further research (covered shortly). Both of the sites above provide access to the book valuations of used cars if you register and give them lots of personal info ("book valuations" are a database of what a particular model of car is currently going for on the second hand car market, they are kept by the insurance and car dealership industries). I'd personally suggest you avoid handing them your info and simply browse used cars for sale matching the trim, age and mileage of what you're looking for, you'll get a good idea of the book price quickly enough. Parkers' used car search interestingly actually tells you on each used car listing how much lower than book it is if the asking price is well below book price, so very quickly from that you can figure out the proper book price without handing over personal info. Furthermore, when you do the HPI check when you're serious about bidding most HPI checks will tell you the current book price for that car, so you'll get the book price before you bid in any case. A lot of people will think this sounds like a lot of work and far more than you should invest in buying a used car. But I'll argue the opposite direction, when you're about to drop a quarter of your annual income on something, you should be seriously considering investing as a minimum a good 40 hours of your time doing some research, and it's much easier to invest that time on the internet whenever you catch a spare hour than tramping around viewing cars physically. That's a week of full time work to insure against throwing three months of full time work equivalent down the drain, with potentially more months at risk if you choose a lemon needing lots of expensive and unpredictable repairs. People tend to have really lousy cost benefit estimations, and they tend to severely underinvest effort in selecting the right used car. You should always invest 5% of the potential cost of a risky purchase in prior research at whatever hourly rate to time your employment equals. Remember unexpected and unpredictable time expenses are more valuable than preplanned preallocated time expenses by a large margin, any investment of time now at your leisure to avoid nasty unplanned surprises later is worth it. The two biggest UK car auction companies are British Car Auctions (BCA) and Manheim (the latter company North American readers will immediately recognise). As a non-trade retail consumer you can register on both and start browsing used cars straight away, and with a bit more work of sending in proof of identity etc to avoid fraud or money laundering you can gain the ability to bid on a car when it comes up for auction either in person onsite or online over the internet using a web browser or even an app on your phone. Auctions are still held at one of many sites around the UK with people physically raising flags, but the online computerised bidding system actually handles the bulk of auction sales nowadays, unlike retail consumers business to business car trade went online and remote many years ago. If you win the auction, you pay the auction house via BACS bank transfer and find some way of getting to the auction site to pick up your new car (don't wait too long, they start daily billing for storage a few days after payment). If you're in Ireland like me, it's almost certainly the case that using an Irish auction broker will be a lot easier than doing UK auctions by hand. The Irish auction broker will, for a small fee, do the bidding for you, run Hire Purchase checks to ensure the car is not stolen, formerly crashed or with finance outstanding, and organise getting the car from the auction house to Ireland on your behalf. They may do the foreign car import for you (you need to pay VRT and have a NCT done on any imported car within 30 days), provide the same warranty as buying from a used car dealership in Ireland, and even deep valet your new car so it is shiny clean and new. You can simply turn up and collect your ready to go new used car with all the same safety and assurances you'd have if you bought from a main dealer. 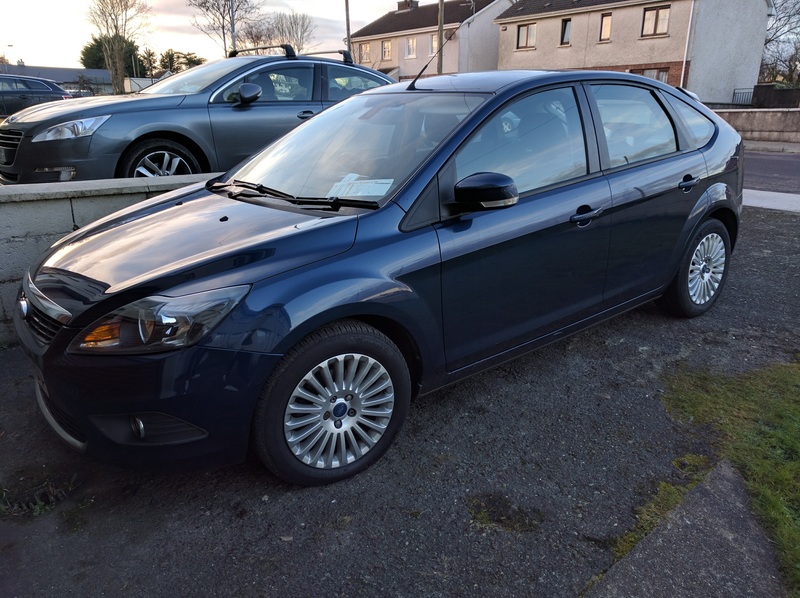 For my 2011 Ford Focus above, I used the Irish auction broker http://ukcarimports.ie/ whom were a pleasure to deal with. The single best thing about them compared to other Irish auction brokers is that you can search BCA and Manheim auction listings direct from their site which very usefully adds in the UK book value, the estimated VRT, the fee for transporting the car to Ireland and their fee into a unified listing so you can see rough pricing for each auction item. This saves having to arse about figuring out book values and VRT values by hand if you use BCA or Manheim's websites directly. They also provide an à la carte pricing structure, so you can buy a warranty or not, a valet or not, VRT and Irish number plates or not, and so on. What do the auction listings mean? 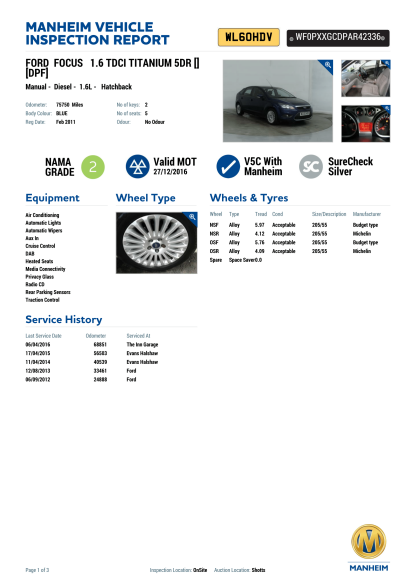 The first page indicates most of the most important information, the first being the reg and the Vehicle Identification Number (VIN) because you can use those to look up much more stuff online elsewhere. You find out if there is any odour in the car, what its tyres are like, any optional equipment and any service history (you want regular services at least every 15,000 miles and ideally at a main Ford dealer, in the case of mine above Evans Halshaw is a main Ford dealer so all but the most recent service was spot on). As if you drove it new off the forecourt, apart from normal wear and tear. This grade has no scratches, dents, nicks, chips, no dirt internal nor external, nothing broken. Your steering wheel and gearstick might be a little shiny, there might be a few tar spots near the wheels, otherwise this is an as if new car. Needless to say this requires very careful ownership and is therefore rare. Cars of this grade regularly fetch 10-20% above book price. One or two deep scratches requiring a body shop to fix, a few very minor broken items. My car, a NAMA grade 2, had one deep scratch on the rear bumper and a broken clasp on a small internal storage bin, nothing you'd worry about and far better than I could manage in five years of ownership. Cars of this grade regularly fetch 5-10% above book price. Multiple bodyshop only repairable damage like deep scratches, scuffs or small dents not causing rust to reach metal, but nothing structurally damaged. 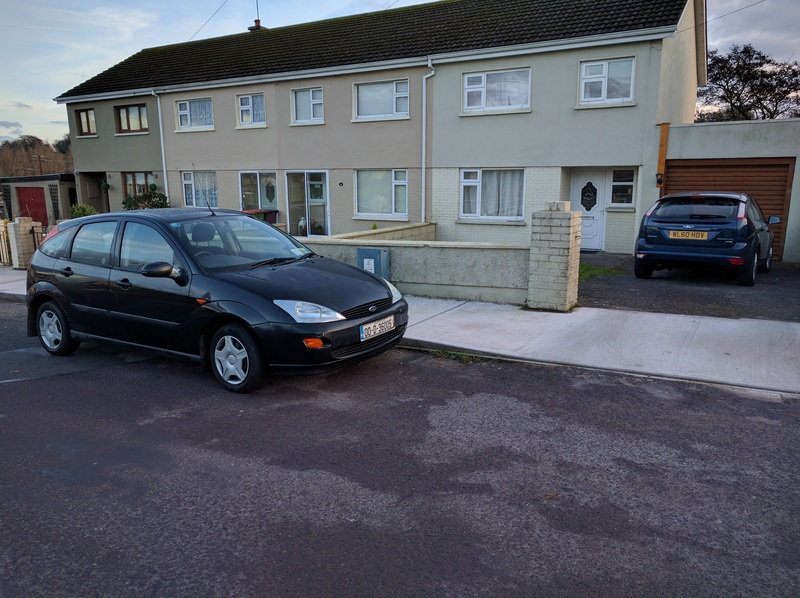 A conscientious owner without walls near the doors of their parked car could achieve a Grade 3 after many years of ownership. At least one item like a door handle is missing or a door will not stay closed on its own. A car of this grade would typically require a dealership buying it to do some work on it before it would be sold second hand. Generally the work needed to get the car up to Grade 4 isn't expensive, a few hundred euro at most. Most reading this page won't want to buy a used car at this grade unless they are a mechanic. The Valid MOT part is important because you can look up the complete MOT history of any UK car using the reg at https://www.check-mot.service.gov.uk/ and thus make sure the car's odometer hasn't magically rewound itself (see my car's MOT history here). You can also see what it failed any MOT test on - this hints at whether the previous owners were conscientious or not, so worn tyres are fine, suspension damage is a big red flag as it was potentially driven by someone incompetent or drunk and chassis damage might be present. The V5C thing means that the hard copy paper registration certificate comes with the car, if this is missing it's the same as missing the logbook with Irish cars, you can ask for a new hard copy from the government which is simply extra hassle so if the V5C comes with the car life is a little easier. The SureCheck thing is important, scroll down a bit to see more on that. The second page, and usually many more pages, show photographs of all the external damage to the car, so every scuff, scratch and chip to the bodywork, wheels, windows and lights as well as any soiling, tears, scratches or other damage to the internal surfaces. Note that this is purely a cosmetic damage report, it says nothing about mechanical problems or problems with the electrics. My report above is very unusual in having so few problems. Finally, a mechanical report, if paid for by the seller, will finish the condition report (sometimes this is supplied in a separate document also attached to the auction item detail). BCA's standard mechanical report gives more detail than Manheim's Silver level report, but not as much as Manheim's Gold level report. Most auctions of cars over eight years old will be missing a mechanical condition report because cars eight years and younger get an almost free mechanical condition report with the top end subscription package for vendors. You definitely want to be buying only cars with mechanical condition reports, so that probably means cars eight years old or younger. Even if they are frighteningly low on detail, you'll weed out cars with weird noises coming from the engine bay, cars which struggle to start, shot power steering, ABS dead and so on. All these are red flags and avoid any car with any reported mechanical issue including warning lights being on (service needed lights being on may be acceptable). 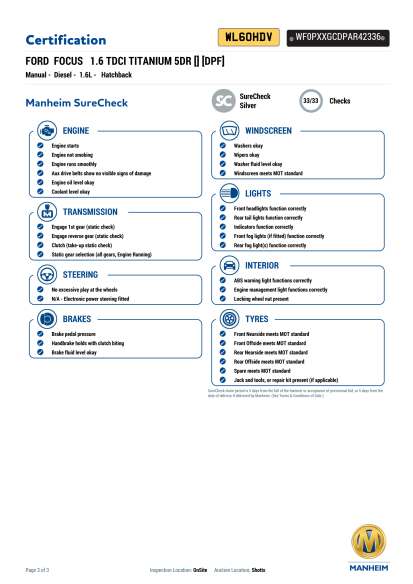 Mine above only has the Silver level Manheim check and as a result is missing checks that any of the interior electricals work. I wouldn't personally recommend you take the same risk as one big advantage of viewing a car in person before purchase is that you can test this stuff works, but in my case it worked out okay - all my internal electricals work perfectly. As a general rule, the younger the car with less mileage and the more main dealer services the more likely the electricals will be all fine, still if you can, a car with BCA Assured or Manheim Gold level checks is safer. For most modern cars, more than a third of warranty claims will be for faulty electricals. How reliable is the auction report? How do I know it's a good car? The auction reports tend to be very reliable. Auctions are trade-only mostly and also mostly done remotely online nowadays, so if the auction house doesn't come up with accurate reports they get into serious hot water quickly (i.e. lose business and go bankrupt) as the big trade customers desert them. Both BCA and Manheim guarantee their condition reports, so if the car you buy does not match the auction report they pay to make it good. These are all big incentives to ensure reports are reliable. The biggest problem with auction reports ultimately is lack of detail. But what you the retail bidder can do is only bid on cars with a maximum amount of detail, so only look at cars with low mileage, perfect service history at main dealers, perfect MOT history, maximum detail mechanical reports and so on. Cars with NAMA Grades 1 to 3 will tend to have had careful owners as it's amazingly easy to drop a car into Grade 4 with a single careless moment as I've discovered the hard way. In terms of knowing if it's a good car, well, there's always the chance a used car is a lemon and somebody is getting rid of it quick because it's become a cash hole. Even a very well maintained car can be a lemon. In the end, lemons will turn up at auction less frequently than at private sale, but probably as frequently as at a dealership which probably bought the car from auction anyway. Once you've spotted a few auction listings you like the look of and have become serious about bidding upon, it's time to do even more research on the exact car you want to bid upon before you place a bid on it. The first thing you ought to do is check if the car has ever been crashed, stolen, has finance outstanding etc lest you get a nasty surprise. The cheapest web service I found for that was https://totalcarcheck.co.uk/ for £1.89 per lookup. It gives a fair bit of detail, though not whether the car has hire purchase outstanding. For £8.99 they'll also tell you what finance is outstanding against the car, plus its book valuation which is handy to know when deciding what your maximum bid ought to be. For £14.99 they'll let you do three car checks at the £8.99 detail level which can be useful to save a bit of money in case you get outbid. When deciding on a maximum bid, remember NAMA Grade 1 tends to attract 10-20% above book, Grade 2 5-10% above book. The second thing you ought to do is find out where the manufacturer's service web page is where you can enter a Vehicle Identification Number (VIN) as shown on the auction detail to get a complete record of the car from its birth until now (in so far as the manufacturer knows). This record will show any outstanding unapplied recall notices against the car e.g. that its brakes occasionally totally fail and so on. 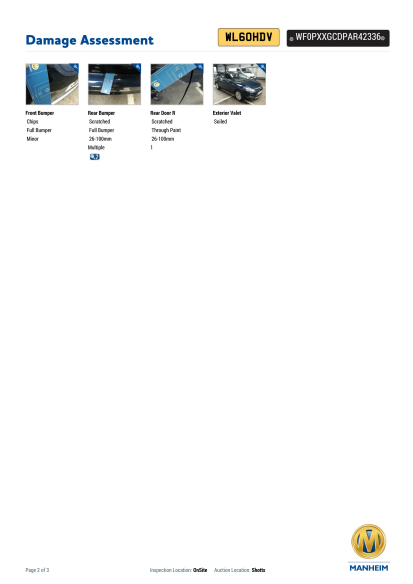 Each manufacturer will be different, but for Ford the page you want is http://www.etis.ford.com/vehicleRegSelector.do and simply enter the VIN to get the detail. The detail on this page is pretty profound at least for Ford - it will tell you the factory which made the car, the production line, and every single little tiny customisation on the car (Ford makes several thousand unique customisations of the Ford Focus). It shows just how bespoke modern car manufacture has become whereby a customer can order to an amazing level of detail exactly what they want in their new car. Anyway, as you'll see from the production detail for my car, mine definitely has the "Stage V emissions" DPF i.e. the reliable one. I also found out that my car rolled off the production line on the 6th October 2010 despite being sold in February 2011. And I confirmed that no unapplied product recalls were outstanding against my vehicle. If you're Irish, the third thing you now need to do is look up the VRT to be paid on import of the vehicle to Ireland. You can do this at https://www.ros.ie/evrt-enquiry/vrtenquiry.html?execution=e1s1. Note that the VRT rates are changed monthly, sometimes they go up as well as down so any VRT quote you get now may change by the time of payment. The rate of VRT also depends on manufacturer claimed CO2 emissions like the motor tax does, and you want to stay under 140g/km to keep the VRT down if you can. Most of the younger cars on BCA and Manheim tend to be ex-lease cars automatically retired when they reach a certain age or more usually mileage. In Ireland lease cars are synonymous with high mileage sales reps and taxi firms and while that is the case too in the UK, more lease cars tend to be placed with companies which don't do much driving. You can therefore find an ex-lease car with a superb all main dealership service history and low mileage for a bargain, with the only caveat that most of the people driving it won't have been used to driving that car i.e. expect a lot of scuffed or damaged or even mangled alloy wheels. For the cost of a new set of steel wheels, you can often pick up a very nice used car for as much as ten thousand less than on the second hand market depending on what you are buying. Much of the remaining auction stock you'll see on BCA and Manheim comes from trade-ins, so when someone bought a new car they traded in their current car. In the UK dealership storage space is far more limited than in Ireland, so if the dealer doesn't think they can flip the trade-in immediately it almost always gets sent on to auction. You will hence find a large chunk of cars aged exactly three or five years old because that's when the dealership warranty runs out and the owner therefore took out hire purchase for exactly those number of years knowing they'd be disposing of the car when the warranty expires. For those owners keen on reliable, trouble free motoring, that's when they tend to buy new with a tradein and a new hire purchase agreement for a brand new car, so effectively every month's pay cheque always has some roughly equal value being taken off it to repay the finance continuously. You'll know these cars immediately from the finance check you did above, if the finance got lifted just before the auction (as it did in my car's case), it's a trade-in. Finally, as with buying any used car (as indeed with buying any new car), there is always the risk of buying a lemon i.e. a car which turns into a cash hole of never ending, randomly occurring, expensive to fix problems. Buying from a dealership is actually nowadays mostly the same as buying from a trade auction site except the dealership has valeted the car, probably brought it up to NAMA Grade 4 (indeed most used car specialist dealers buy Grade 5 cars from BCA and Manheim, fix them up and sell them on) and has added a warranty usually bought from someone like http://www.mapfrewarranty.ie/. Thing is, MAPFRE sell direct to retail consumers too, so if you want exactly the same warranty as buying from a forecourt just go ahead and ring MAPFRE and buy the warranty yourself instead of handing commission to a dealership. Be aware that warranties not covering all the electricals are worthless. Don't bother with them. Half of all warranty claims for modern cars tend to be for electricals or suspension. Most warranties won't cover most of the suspension else every careless driver would be into them. Unsurprisingly, warranties including all electricals tend to cost a lot more than warranties just covering the powertrain which very rarely fails if you've done your pre-bid research above right. Also watch out for warranties excluding turbos, catalytic converters or DPFs. And remember to service your car according to its schedule, else the warranty will be voided when you come to claim. Modern cars are enormously computerised and when a car goes wrong, the first thing the mechanic will do is plug a computer into the car and ask its onboard computers what has gone wrong. 80% of the time the onboard computer will simply tell you straight out exactly what item needs replacing. If you end up with a car that is seeing multiple random failures, rather than dragging it into a mechanic every time and paying them their fee, it can be worth buying a USB adapter from eBay which lets you plug a Windows laptop into your car so it can talk with the car's computers. Each car is different on this, in the case of Ford cars you want an ELM327 USB adapter with preferably a TDCI chipset and a HS/MS CAN switch which will cost about €25. Using that with a free utility called Forscan you speak with your car's many onboard computers and bring up a history of every thing that has gone wrong and usually the cause becomes evident e.g. if the communications bus keeps dropping out, it'll be a loose wire or connector somewhere on the bus wiring. Keeping track of these failures in combination with a Haynes manual can help you diagnose the likely problem quickly - most mechanics don't have the spare time to properly investigate random failures. Equally, if the frequency of the failures are getting worse and the onboard computers can't figure it out, it's time to get your car sold on and get a new one because your car is likely lemonising.